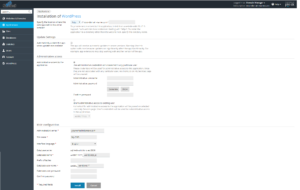 How to set up your first website in Plesk? Hosting — FAQ - How to set up your first website in Plesk? When your hosting subscription has been created, also your domain is automatically being added in Plesk control panel. We can call this domain name the first domain of your subscription. To start using your website you should have your website’s content uploaded. You could use either professional Webmaster service or create your website by using one of our available applications in Plesk’s 1-Click application installer – in this case take a look at the following steps. Go to card Applications and press All Available Applications, where you would find the list of all the applications available in Plesk, all with 1-Click installation. WordPress is the most popular web application that allows you to create any type of website – from a blog to an online store. Press Install to get the newest app version. If you want to set WordPress to custom location, manually set the name of WordPress database or change other settings – choose Install (Custom). To accomplish the installation you have to set some mandatory settings. HTTPS protocol supported with SSL/TLS certificate provides better security in comparison to HTTP. There are different types of SSL certificates. You could use Plesk’s free Let’s Encrypt certificate solution, or choose one of the offered certificates from our SSL Shop. Add extension if you want to install app in custom directory. You can choose to have automatic updates. Consider, that some updates might affect your website functionalities. Tap Install to finish installation. After you accomplished installation you can start creating your website’s content using chosen application. Go to Websites & Domains card, WordPress plugin should be already visible over there. 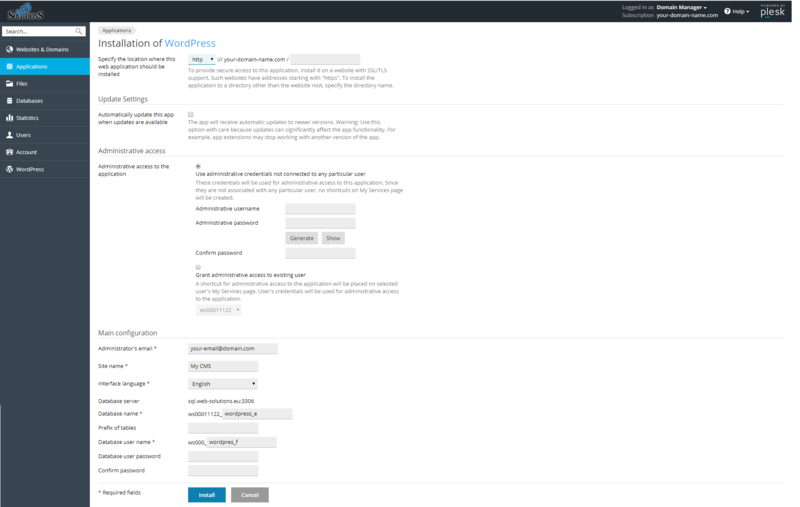 Press Log to button, which will redirect you to the WordPress backend Control Panel. Alternatively you can go to your website adding suffix ‘/wp-admin/’ for example ‘www.your- domain-name.com/wp-admin/’. How to reset your password to our Plesk panel on our Linux hosting?